Students and/or industry participants build buoyancy shoes to ‘walk on water’, racing across the length of a swimming pool against other teams. Student organizations are expected to have refreshments available for attendees to purchase as part of their fundraising efforts. The Walk on Water Competition is held every year to promote the field of Engineering and its importance in society. More specifically, the goal of the event is to promote fundamental scientific and engineering design principles that are the core foundation of all engineers. Students are assigned the task of designing, constructing, and piloting water shoes across the pool. They must consider three important design considerations; buoyancy, stability, and propulsion. The entire process will allow one to gain experience at applying the engineering design process and ultimately, to solve open-ended engineering problems. The 2012 Walk on Water competition was held on Saturday, October 20, 2012 at the Southwestern Community College swimming pool, from 9:00 – 1:00 PM. The competition had over 34 attendees, with 8 teams from Southwestern College, San Diego State University, San Diego City College, San Diego Mesa College, and La Jolla High School. 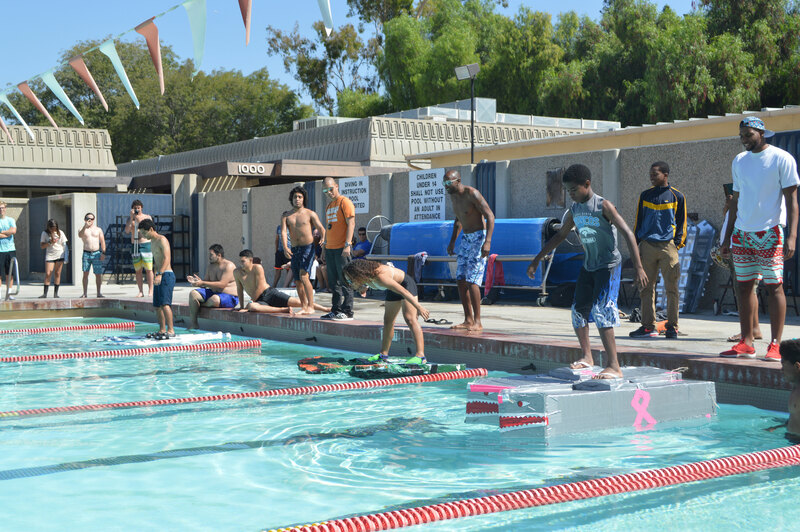 Teams of MESA students designed “buoyancy shoes”, and student “shoe pilots” race across the length of the pool. The competition allows students to gain experience at applying applying the engineering design process; solving open-ended problems. Some of the campuses respective MESA programs’ refunded costs to build the buoyancy shoes that teams created to ‘walk on water’, up to $100. Southwestern College student organizations such as AMSA (American Medical Student Association) and SHPE (Society of Hispanic Professional Engineers) sold refreshments as part of their fundraising efforts. The 2012 Walk on Water competition will be held on Saturday, October 20, 2012 at the Southwestern Community College swimming pool, from 10:00 – 1:00 PM. Registration will begin at 9:00 am. Free parking will be available in Lots K and L.
The competition is expected to yield over 80 attendees and over 10 teams from Southwestern College, San Diego State University, San Diego City College, San Diego Mesa College, and various high schools within the San Diego MESA Schools Program (San Pasqual High School, Mark Twain High School, Crawford High School), and La Jolla High School. Some of the campuses respective MESA programs’ will refund costs to build the buoyancy shoes that teams create to ‘walk on water’, up to $100. Southwestern College student organizations such as AMSA (American Medical Student Association) and SHPE (Society of Hispanic Professional Engineers) are expected to have refreshments available for attendees to purchase as part of their fundraising efforts. The 2011 Walk on Water competition was held on Saturday, October 22, 2011 at the Southwestern Community College swimming pool, from 9:00 – 1:00 PM. The competition had 88 attendees, with 13 teams from Southwestern College, San Diego State University, San Diego Mesa College, and various high schools within the San Diego MESA Schools Program (San Pasqual High School, Mark Twain High School, Crawford High School), and La Jolla High School. 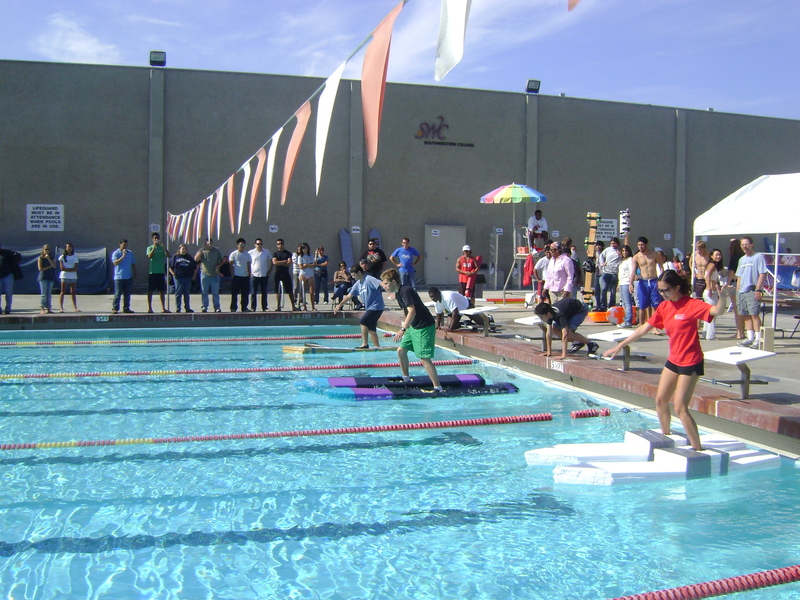 The 2011 Walk on Water competition will be held on Saturday, October 22, 2011 at the Southwestern Community College swimming pool, from 9:00 – 1:00 PM. Invitees include teams from Southwestern College, San Diego State University, San Diego Mesa College, and various high schools within the San Diego and Imperial Valley MESA Schools Programs. 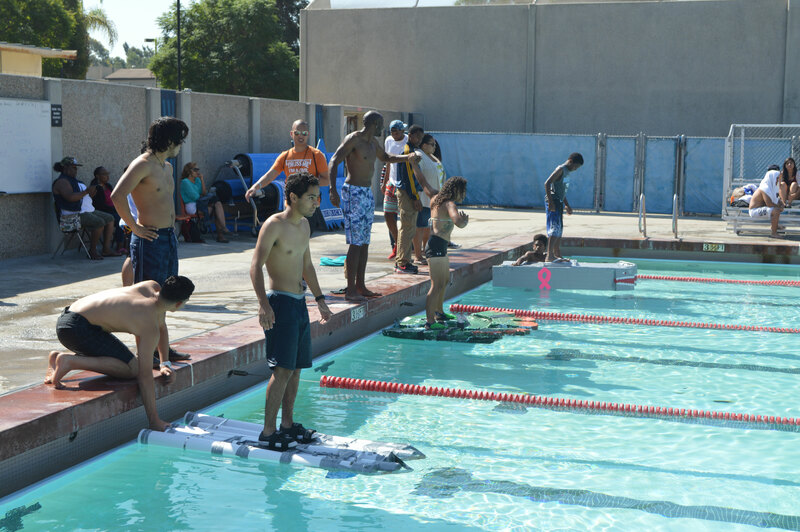 About 200 middle school students competed at the Central Union High School swimming pool during the Mathematics Engineering Science Achievement program’s “Walking on Water” competition. Twenty-seven schools throughout the Imperial Valley entered the competition that required, in addition to two months of preparation, a keen focus on how math and science mesh in engineering, said Jeanette Espino, MESA program director. While the would-be inventors got to bask in the sun and splash in the water, Espino said the competition also serves as a useful instructional tool. More than 200 high school students will get to do the same at 5:15 p.m. today during their MESA competition at CUHS’ swimming pool.